Every once in a while we find an item in the attic that is as perplexing as it is interesting and requires some serious investigation to decode its meaning. 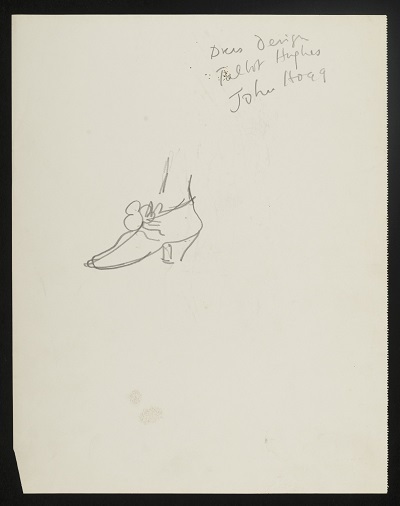 Such an item came to our attention this week; a charming sketch of a man in historical costume with two names in the hand of Duncan Grant inscribed on the back; those of Talbot Hughes and John Hogg. The name Talbot Hughes is familiar, practising as a genre artist exhibiting at the Royal Academy and the Society of British Artists he also amassed a large collection of English historical costumes and accessories, dating from the 16th to the 19th centuries. An admirer of the French classicist painter Jean-Louis-Ernest Meissonier, Hughes was meticulous in his attention to detail and his extensive costume collection allowed him to style his models for his artworks accurately. The 752 piece collection of garments and accessories were sold to Harrods in 1913 for the sum of £2,500 and were displayed at the store for three weeks before they were sent to the Victoria and Albert Museum, where they went on display on Christmas eve 1913. In comparison to the wealth of information about the life, art and collections of Talbot Hughes, details about John Hogg proved to be more elusive and the connection between the two hard to fathom. It was when research revealed that Hogg had been a publisher working in London in the early twentieth century, publishing titles such as ‘Silverwork and Jewellery: a textbook for students and workers in metal’ that things began to fall into place. 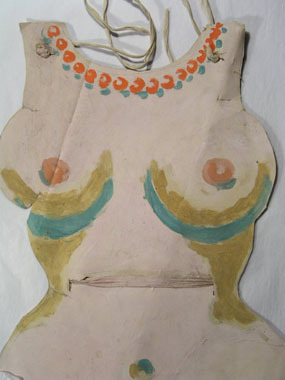 In the year that Hughes sold his collection to Harrods he also collaborated with Hogg in the production of a book titled ‘Dress design: an account of costumes for artists and dressmakers, illustrated by the author from old examples.’ The contents of the book demonstrate the wealth of Hughes’ knowledge on the subject and the varied nature of his collection with chapters ranging from ‘prehistoric dress’ to ‘the character of decoration and trimmings of the eighteenth century.’ Adorning the pages of the 1913 edition are illustrations of costumes throughout the ages by Hughes, demonstrating the attention to detail he is known for in his paintings. Grant’s drawing that we found nestled in the boxes from the Angelica Garnett Gift appears to be a study from this book, his handwritten notes on the back providing helpful clues to the images origin. 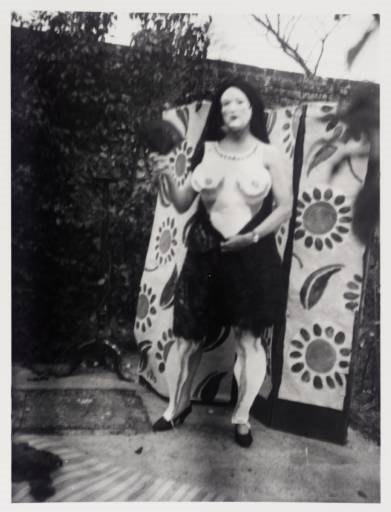 Previous blog posts such as ‘Ballet and the Bloomsbury Group’ have explored Duncan Grant’s artistic relationship with costume design and the theatre. Grant’s practice of studying artworks for his own artistic development and for inspiration has also been explored in relation to the Angelica Garnett Gift with a blog post about the studies of Raphael. Why Grant chose this particular costume to sketch we can only speculate, it may be that there are many other costume studies yet to be found in the Gift. We know that Grant was commissioned in 1914 to produce costumes for Jacques Copeau’s adaptation of Twelfth Night by Theodore Lascaris, a creative collaboration between the two men that was to continue until the outbreak of war in 1918. Designing the costumes for the production Grant desired to sustain the mood of comedy and as a result ignored details such as hats and swords, neglecting historical reality in favour of shape and fluidity, something Hughes no doubt would look upon negatively. Earlier in our exploration of the Gift we uncovered possible sketched designs for a production of Macbeth by Granville Barker in 1912, a project which was later abandoned in 1913. Could the study of historical costume found this week in the attic be connected to either of these Shakespeare productions or does it represent Grant’s artistic diversity and self-imposed life long education as an artist? Whatever the sketch’s original purpose, today it represents a fascinating insight into Grant’s artistic practice, as well as being a beautiful and interesting drawing. 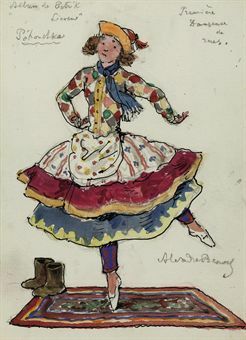 Grant’s sketch and annotations closely match one of Benois’ designs for a costume (note the winy purple & dark purple stripes of the First Street Dancer’s leggings), and a photograph of a character printed in the 1911 programme (note the striped bodice, bell-shaped skirt and white cap of the dancer in the top-left vignette). Although Grant was not involved in the production himself, it is highly likely that he would have attended a performance at some time and recorded the unusual outfit of the dancer on stage in a sketch. 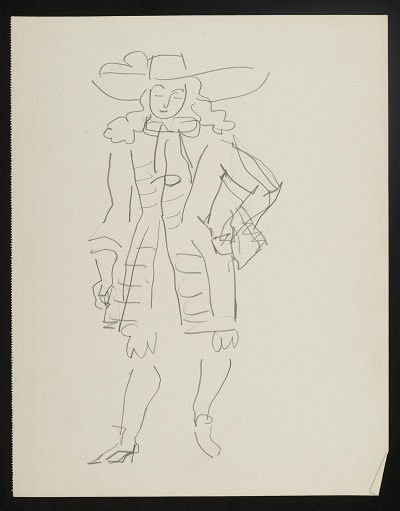 Kept amongst other designs in Grant’s studio at Charleston, perhaps this small drawing was later used as a source to inspire his own costume designs for Jacques Copeau’s productions – we can only speculate. What is certain, however, is the importance of cataloguing and researching the items in the Angelica Garnett Gift to enable such discussions which both enrich and enliven existing Bloomsbury scholarship. 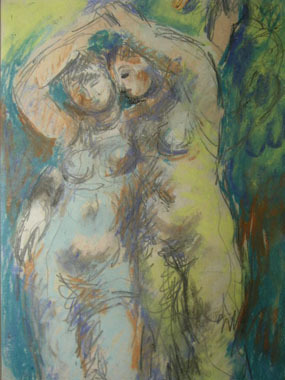 When photographing small works on paper in the Gift, we came across this biro sketch on cardboard made by Duncan Grant. Depicting a dancer en pointe in an elaborate costume, the drawing is surrounded by annotations detailing the colours and fabrics to be used. ‘White fur cap & gold stripes,’ ‘winy purple & dark purple stripes,’ ‘red velvet’; this would have been a flamboyant and unusual ensemble. 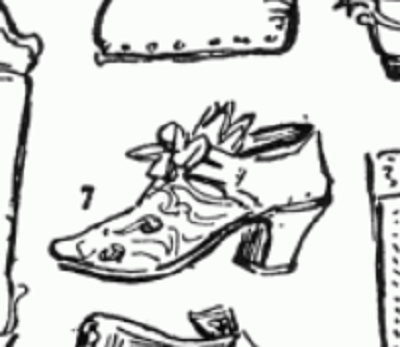 The significance of this small sketch is two-fold: firstly, it provides a glimpse into the progressive world of modernist dance and theatre in Britain in the early twentieth century. Secondly, it offers a primary resource to consider Grant’s own costume designs for both professional productions and later theatricals held in the garden at Charleston. 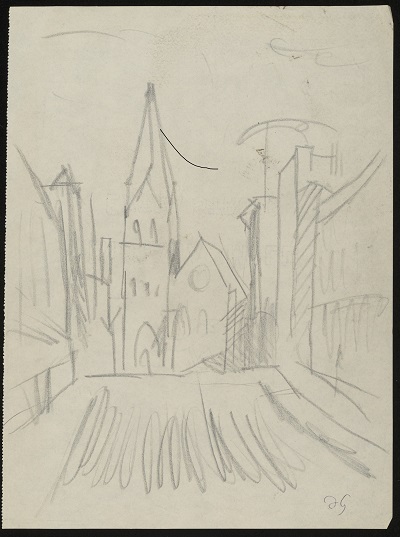 While the sketch is undated and therefore unable to be linked to a particular production without further research, it offers an intriguing insight into the artist’s practice and influences. In 1909, Diaghilev’s Ballets Russes took London by storm. The company’s ground-breaking performances showcased collaborations between the world’s leading dancers, choreographers, composers and designers, and delivered a spectacular blow to a British audience familiar with the delicate and refined classics. Along with other members of his circle, Grant became a frequent visitor to Diaghilev’s productions, which he had first seen in 1909 with his friend Lady Ottoline Morrell. At Lady Ottoline’s wartime parties during the winter of 1914-15, an atmosphere of ‘pure hedonism’ reigned, influenced by the success of the Ballets Russes. Guests would dress up in unusual costumes and dance wildly until the early hours. The hostess recalled one party when, ‘Duncan Grant was almost fierce, but full of humour and grace, as he bounded about like a Russian ballet dancer, or wound in and out in some intricate dance with Vanessa Bell or Bunny Garnett, who looked really fierce and barbaric in bright oranges and reds, a gay-coloured handkerchief on his head.’ This spirit of freedom was upheld at Charleston, where a variety of productions were staged in the garden throughout the years, with sets and costumes designed and made by Grant and others. The artist worked on a number of professional stage productions, for which he designed both sets and costumes in his expressive and experimental style. 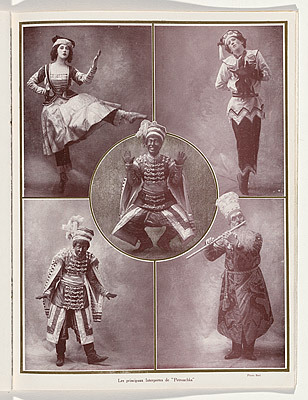 Jacques Copeau commissioned Grant to create costumes for his 1914 production of La Nuit des Rois, an adaptation from Twelfth Night by Theodore Lascaris. The production had a very simple stage dressing; devised both to reduce costs and to offer a modernist aesthetic. ‘I imagine surroundings in every respect unobtrusive,’ Copeau explained, ‘all the amusement of form and colour being produced by the costumes and the gestures of the actors.’ The production was well received, and became Copeau’s most frequently produced classic play. While Grant went on to design costumes for another of Copeau’s productions following his earlier success, their collaboration was prematurely stopped by war. However, he did continue to design stage sets in the 1920s, and collaborated with Vanessa Bell on a production of High Yellow, a ballet set to modern jazz music. The influence of dance and theatricality was not limited to Grant’s stage commissions, but permeated his other works with their freedom of line and playful use of colour. As discussed in a previous post about the influence of the circus on Grant’s work, the physicality of dancers similarly captured his imagination, and influenced his painting style and subject matter equally in unrelated paintings and drawings.